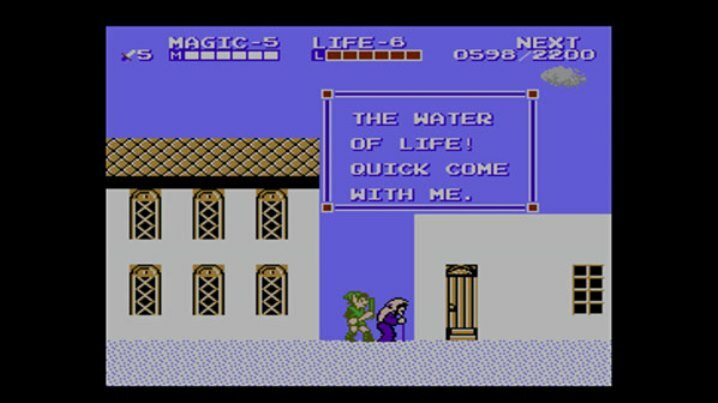 Q1: [Zelda II: The Adventure of Link], within the Zelda series, has a lot of uniqueness to it. How did the development start? – Development started with Mr. Miyamoto saying he wanted to make a side-scrolling action game that made use of up and down movements for attacks and defense. It’s rooted in actions like jump strikes, downward strikes, and high and low shield defense moves. Types of moves that weren’t possible in the ?rst game. Rather than being a continuation of the series, it started as a new sword and shield type of action game. We were experimenting while producing the game so we didn’t really have the ?rst game’s systems in mind while developing it. As for it being unique within the series, we were searching for new ways to play so you could say it’s like a spin-off. At the end of development we decided on a story and that Link would be 16 years old then attached [The Legend of Zelda 2] and released it as the second game in the series. Q2: How did it feel to be developing games at that time? – That was 30 years so I don’t remember much (sarcastic laugh). At that time a game was developed by 10 or so people. It’s almost not comparable to the size of the teams developing games these days. I think the development time for [Zelda II: The Adventure of Link] was on the long side for games of the time. Materials and documents were all on paper and passed around between team members. I miss those days. Q3: How did the title of the game come about? – When thinking of a way to best describe the contents of the game, [Zelda II: The Adventure of Link] seemed to pass without objection… (I forgot). For the ?rst title we used [The Legend of Zelda] and at the time titles that made games sound like stories were rare so we decided to do that. Q4: I found the battles in the game to be extremely hard. Was this kind of dif?culty level normal to the players of that time? – It’s dif?cult? (laughs) The foundation of action games at the time was to feel dif?cult for everyone. Games didn’t have a ton of content at that time so in order to have them played for as long as possible we felt like we couldn’t make them easily clearable. We also did debugging so we would play a game too much and the game would have a high dif?culty that was interesting to us. One thing I remember is a call that we received from a customer at the time. He said he just couldn’t beat the ?nal boss. We talked with him and found out he was fully equipped so we had to tell him he could only rely on his skill at that point. A pretty tough answer, right? The person seemed to playing on behalf of a child… Sorry about that. Q5: Features like Link leveling up and encountering symbols in the ?eld to start battles were features that are unique to [Zelda II: The Adventure of Link]. How did this come about? – There were various restrictions at that time so we put in the level up system as a way to have players battling enemies time and time again. As for the symbol encounters, the ?eld map was narrow so the system added a luck factor to it. Q6: What are some ways that [Zelda II: The Adventure of Link] has in?uenced the rest of the series? – I haven’t been directly involved with the series since this game but there are some examples that come to mind such as the names of the towns. After [Zelda II: The Adventure of Link] they were used as character names (Town of Saria, Town of Ruto, Town of Rauru). I also think the game in?uenced some of the sword techniques such as the jump strike and downward strike. Q7: To close, there are fans out there who’s favorite game in the series is [Zelda II: The Adventure of Link]. Do you have a message for these unique fans?